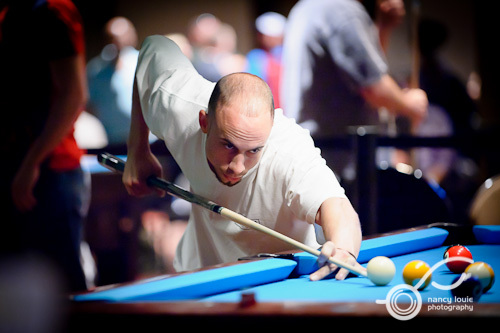 It was my ultimate pleasure to be able to photograph pool players in action last weekend. Atlantic City, NJ was the host location for the APA South Jersey annual LTC (Cities) tournament. This is the qualifier for teams to play in the nationals in Las Vegas. However, I am also a player so it was difficult to do both. Fatigue and concentration not withstanding. I needed to clone myself to be in more than one place at a time and grow another pair of arms. As far as technique is concerned, you need to shoot with wide open aperture and without a flash. A flash would be very distracting in this situation. I also used a 70-200mm f/2.8 lens. Why? To remain unobtrusive to the player(s). A longer lens will allow you to photograph from a distance and not be in someone’s face. Most of the players had no idea that I had taken their image as they were playing. In using a longer lens, you would need to get your shutter speeds up or you might get camera shake and blurry images, so boost your ISO (the D700 is a low light champ for this) to get decent shutter speeds. Since the tournament area is pretty crowded, a wide open aperture lets more light in as well as blurring out some of the distracting background. The tournament area was fairly dark, primarily lit by standard light fixtures over the tables. This is often a photographer’s worst nightmare when you can’t add in artificial light. I decided that I would use it to my advantage because the light cast was more dramatic and not flat. I needed to combine my field of view with timing so that what little light provided would enhance the look and feel. The only issue I encountered was when people wore a lot of white and were directly under a light. Lightroom post processing with the Recovery slider took care of most of it. I burned the rest where needed. Tricky but in the end, it was worth it for images that pop. I’m not going to Vegas, but I did get my shots. I couldn’t allow the time to slip away without mentioning Nikon’s announcement of their new D4 body last week. It’s a beauty. Finally, a larger sensor format at 16.2 megapixels with tha t venerable high ISO performance in Nikon’s lineup. Here’s the link to Nikon’s official press release on the bells and whistles. New sensor, new color matrix meter—may mean that Nikon is going to lay claim to being the low light champ with increased MP size at the top of the heap. Considering how difficult it is to a have larger capture size being noise free without making other sacrifices, I marvel at their efforts. Some of the pundits were confused by the timing of the release, but I’m not. It makes perfect sense that Nikon would release this for pros in time for the Winter Olympics. I was concerned that the earthquake/tsunami in 2011 would really set back some of their FX body releases. This is a very positive sign that Nikon is not asleep with just repurposed goods like that “new” SB-910 speedlight. 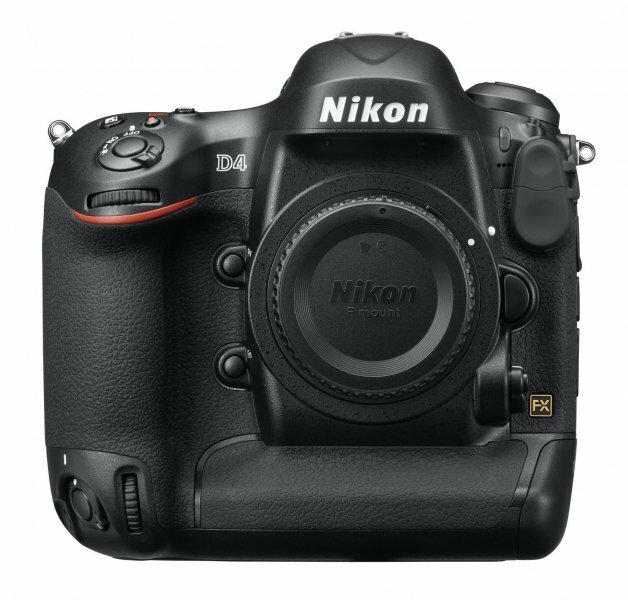 This doesn’t mean that I’m ready to plop down $6,000 USD to order mine in advance (they should begin shipping in Feb.) It’s too large for my needs which is why I passed on the initial release of the D3 when it came out and was happy when the D700 popped a year later. What it does mean is that we can now all freely begin to speculate on an eventual D800 body release with greater certainty that Nikon has finally figured out how to break that 12MP noise ceiling for performance. I hope the lighted buttons feature filters down to the D800. It’s been 3 years and counting since the D700 release. What’s another year? I’ve been waiting for a D700 successor for over three years. There are always rumors about the arrival of new camera bodies and what they are prepared to do for your photography. Take it to the next level? I don’t think that any equipment should bear that responsibility. It takes more than just gear acquisition to make a good photograph. Beyond the technical knowledge, there’s always the harder-to-be-taught subjects like composition and “intent” of the photo. But, hardware is hardware and it looks bleak for new releases at this time. Nikon Rumors is such a popular site for speculation about what’s in the pipeline and its release date. 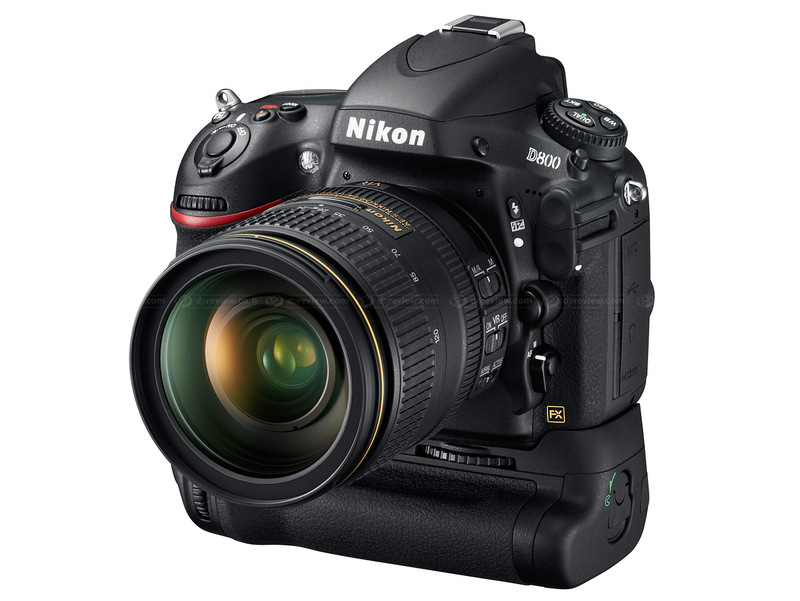 There was heavy spec that Oct. 26, 2011 would bear the successor to the D700. Unfortunately, it’s rumor. The latest developments are being discussed over at Nikonians in good detail so drop in and read more about it. Mother Nature has had a heavy hand in squelching Nikon’s manufacturing process. First the earthquake in Japan in March 2011 and now the Oct. flooding in Thailand. Both locations factor predominately in producing for Nikon. It will take months to recover the cogs in the wheel. Even if the bulk of manufacturing was not affected at both locations, there’s still the smaller components being made by 3rd parties in Thailand that have been hurt/disabled. The best camera is the one that is in your hands at present. I am glad that my gear envy has been tempered through the years. Looks like my wait for a D800 is going to lengthen into 2012. Since Canon’s announcement of the newer PowerShot S100 compact camera on Sept.15, 2011, the Canon PowerShot S95 has dropped to $319. on Amazon. I’d check this deal out if you’re in the market for a super compact camera at a sweet price point. I do own the S95. The image quality is great for a compact P&S camera. The S100 is a little wider at 24mm vs. 28mm (s95) but I won’t mince about the extra angle of view possible. However, it is also longer on the tele end, has new sensor technology that is supposed to be better in low light (with reduced noise) and it’s 12.1MP The S100 is supposed to release in November 2011. DPReview did do a preview of it in case you’re drooling. For most intents and purposes this is a new camera unlike the S95 that morphed out of the S90. That said, if can live without the latest and greatest and save some $ there’s good deals out there on the S95 right now. You’ll save close to $80—$100. I bit the bullet recently since Verizon has made the iPhone available to subscribers. I’m finding good use for my iPhone. I’ve used my iPod Touch for years to hold images to share. iPads are being used as digital portfolios for photographers and designers. It’s not uncommon for users to own more than one iDevice today. Terry White covers all the bases whether you have one or several iDevices. Have a look at his Adobe TV tutorial that shows you how to sync your iDevice with Lightroom images using Lightroom 3’s Publishing Services module. Export to your Hard Drive and then sync it up using iTunes. Most pros aren’t using iPhoto as their application of choice for post processing and handling of digital asset management. Do we really need all these applications? Goodbye, iPhoto!